The Taj Mahal "Crown of the Palace" is an ivory-white marble mausoleum on the south bank of the Yamuna river in the Indian city of Agra. 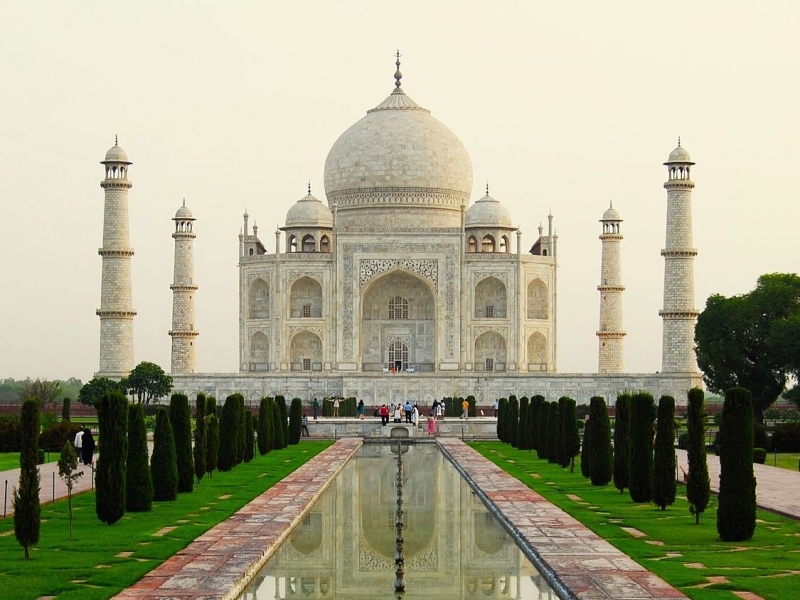 It was commissioned in 1632 by the Mughal emperor, Shah Jahan, to house the tomb of his favourite wife, Mumtaz Mahal. The tomb is the centrepiece of a 17-hectare (42-acre) complex, which includes a mosque and a guest house, and is set in formal gardens bounded on three sides by a crenellated wall. The Taj Mahal was designated as a "UNESCO World Heritage Site" in 1983 for being "the jewel of Muslim art in India and one of the universally admired masterpieces of the world's heritage". It is regarded by many as the best example of Mughal architecture and a symbol of India's rich history. The Taj Mahal attracts 7–8 million visitors a year. In 2007, it was declared a winner of the New7Wonders of the World (2000–2007) initiative. Tourist must carry his/her Identity Proof issued by Govt. Authorities. Water bottle is allowed inside the monument. Shoe cover, water bottle, tourist guide map of Agra, battery bus and golf cart services are provided free of cost with the foreigner's entry ticket of the Taj. For entrance through East gate ticket window and cloak room are available at East gate. For entry through West gate ticket window at West gate and cloak room at shopping complex are available for the visitors. Been to Taj Mahal ? Share your experiences!